Rep. Susan Johnson encourages children in Willimantic to read. 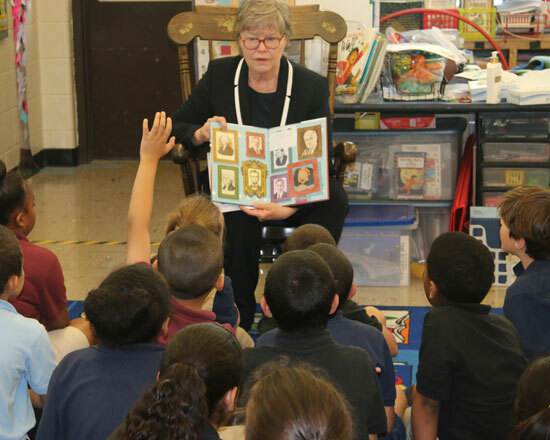 Representative Susan Johnson visited with students at two Willimantic elementary schools to encourage reading and promote civic engagement among young people. Rep. Johnson read Grace for President to third grade students at the W.B. Sweeney School and Natchaug Elementary Schools as part of a reading tour in her district. Grace for President is a story of a young girl who decides to run for class president after learning that there have been no female U.S. presidents. “Grace for President is a wonderful book to begin the conversation with young students about our government and how the people who serve us are elected,” Johnson said. The readings at both schools were followed by a question and answer discussion that largely revolved around civics, social studies and the importance of education to a bright future.